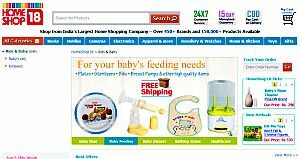 Media house Network18 Group owned portal Homeshop18.com has added baby and kids product categories to its online shop. The website, run by TV18 Home Shopping Network Ltd, will offer baby gear, games, bath and skin care products and a back to school range. This move comes even as two startups running online baby products stores, BabyOye.com and FirstCry.com, raised funding from top venture capital/ private equity firms. In April, BabyOye.com raised $2.5 million from Accel Partners and Tiger Global while Pune-based BrainBees Solutions Pvt Ltd, which runs Firstcry.com, raised $4 million from private equity major SAIF Partners. Homeshop18 is also backed by SAIF Partners and Korean online retailer GS Home Shopping. HomeShop18 currently has over 450 brands across 20 categories including consumer electronics, jewellery, books, apparel and home and kitchen ware. It currently ships to 3000 cities in India and also runs a 24 hour home shopping TV channel. For the new range of baby products, it has partnered with Avent, BSA Toddlers, Barbie, 1st Step, Chicco, Disney, Farlin, Fisher Price, Himalaya, Mamy Poko, Mee Mee, Medela, Nuby, Pampers, Best Lock, Funskool, Hotwheels, Leapfrog etc. Ganesh Ramaswamy, the Himalaya Drug Company, said, "Partnering with Homeshop18 is helping us to widen our reach and make Himalaya's herbal baby care products part of every mother's must-have list." "The Indian baby care market is the most exciting in the world, with 19 per cent of births over the world taking place in India every year. HomeShop18 views a great potential in associating with top bands and taking the industry to the next level," said Sundeep Malhotra, CEO, HomeShop18, in a media release. Firstcry's founder Supam Maheshwari estimated the baby care segment was a $5 billion market opportunity and also indicated that demand is driven from parents in tier 2 and 3 cities, where products are unavailable in retail outlets. In March, Homeshop18 unveiled a new look with enhancements to the shopping experience, technology infrastructure, search and browsing and additions to its product catalogue. It also announced it would launch a dedicated call centre to support its e-commerce business. "Online shopping, excluding travel, is a Rs 800-900 crore market today and is expected to grow rapidly. We are looking at e-commerce market aggressively and have designed our website to support the growth in business and traffic as we expand our product line and engage with global audience," Malhotra had said at the launch.